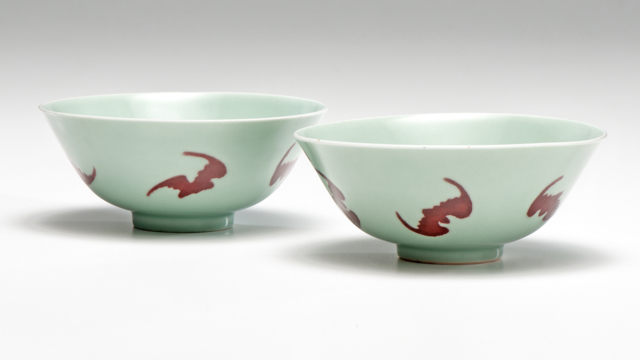 Cowan’s Asian Art Discovery Auction will feature a wide array of exceptional items ranging from porcelain, jade, metalwork, and furniture to paintings and prints from China, Japan, Korea, and Southeast Asia. Significant highlights include an Edward I. Farmer jade lidded ink box (lot 97), a pair of Kangxi period chargers (lot 47), a Chinese Mogul jade dish (lot 12), and a Ming period celadon charger (lot 191). Of particular note is a collection of Chinese porcelain (lots 1, 2, 5, 41, 44) purchased from Gump's Department Store in San Francisco in the 1940s by an important Cincinnati collector, Andrew Jergens. Additionally, the auction will feature Japanese woodblock prints by artists such as Hiroshi Yoshida (lots 143, 208) and contemporary Chinese paintings and scrolls by Dahu Qin (lots 86, 87) and Feng Zikai (lot 80). NO ADDITIONAL PHOTOS OR CONDITION REPORTS. There is no in-person bidding for this auction. Live bidding will occur online or over the phone. You can register to phone bid on Cowan’s website or by calling 513-871-1670. Absentee bids will be accepted on Cowan’s website, Bidsquare.com or LiveAuctioneers.com. There is no preview for this auction. If you would like to look at an item in person at Cowan's Cincinnati location, please contact the Asian Art department to set up an appointment by emailing asianart@cowans.com with the lot number of the piece(s) you would like to examine. Appointment times are limited and will be granted on a first come, first serve basis.